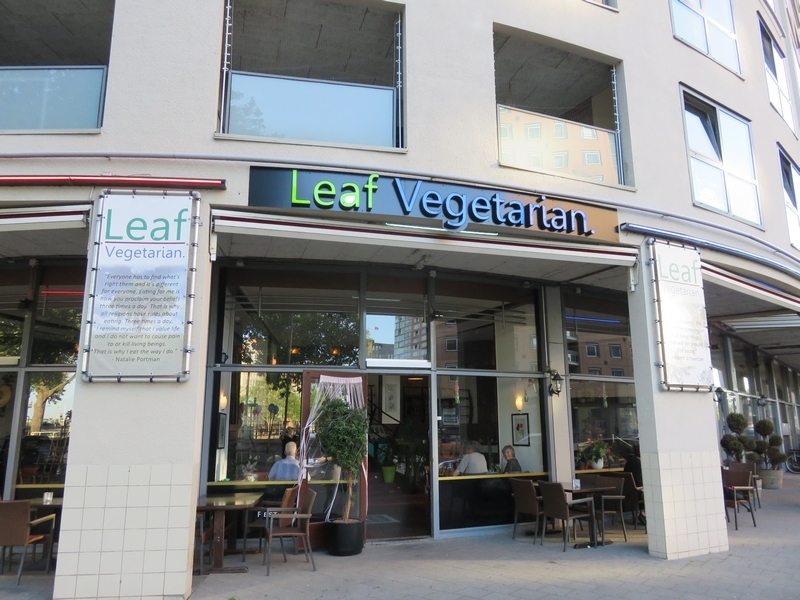 Restaurant review #128 – Leaf is a vegetarian restaurant in Rotterdam (the Netherlands). 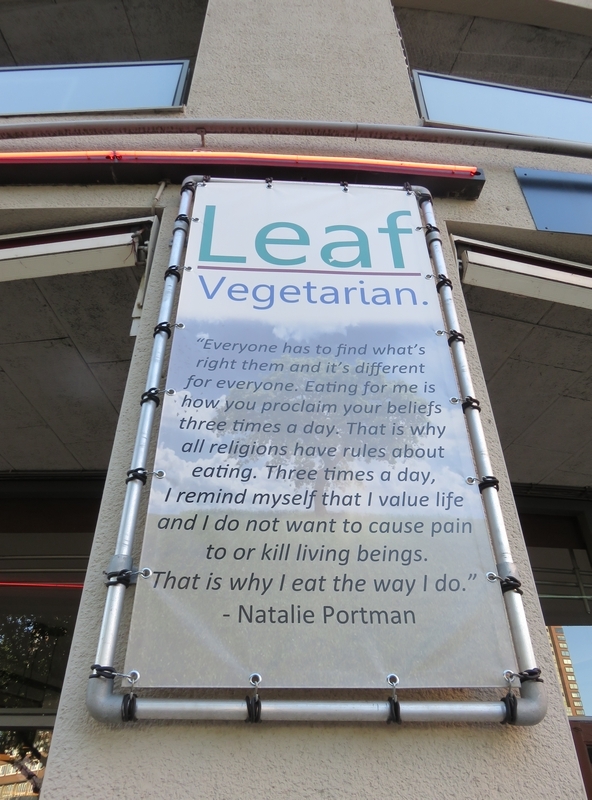 Most of the menu is vegan, there are only a handful of options which are non-vegan. 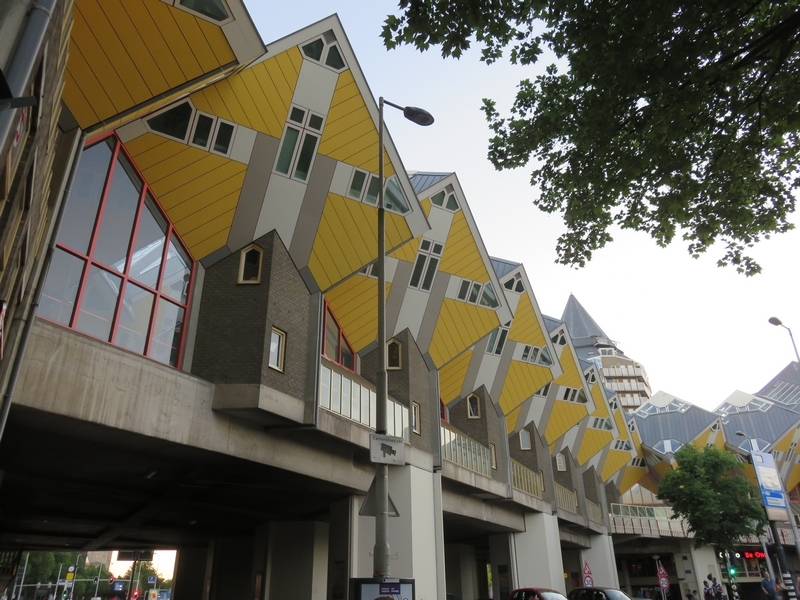 The restaurant used to be in Scheveningen, but moved to Rotterdam recently. 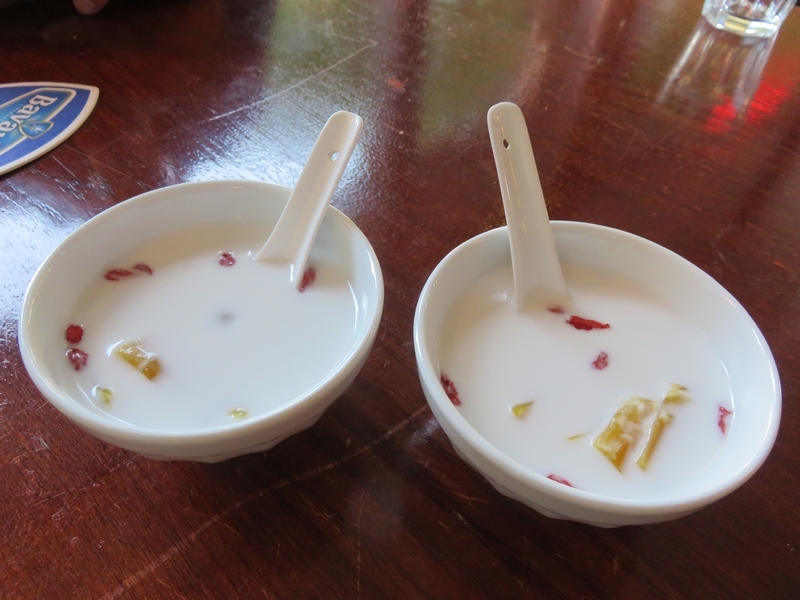 The food at Leaf seems to be a mixture of Asian inspired recipes (Indonesian, Chinese, Vietnamese, etc). 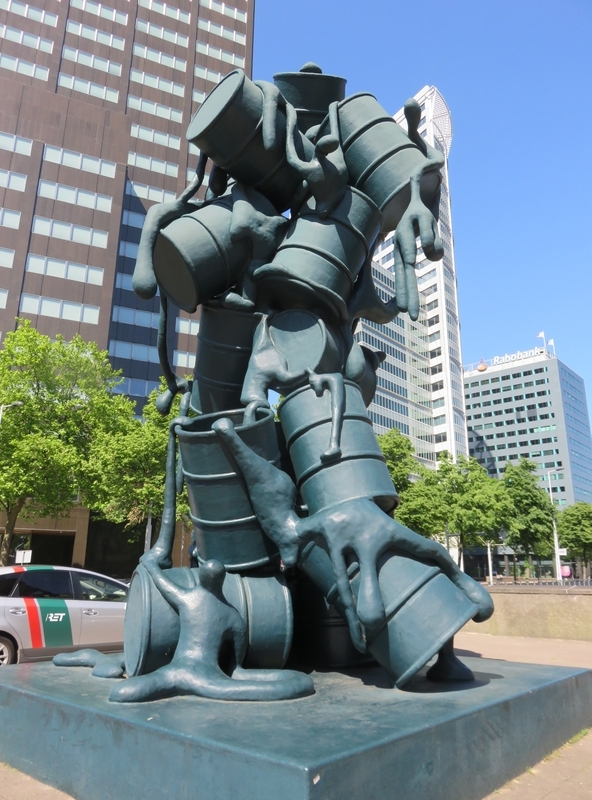 We visited a couple of weeks ago, with friends. 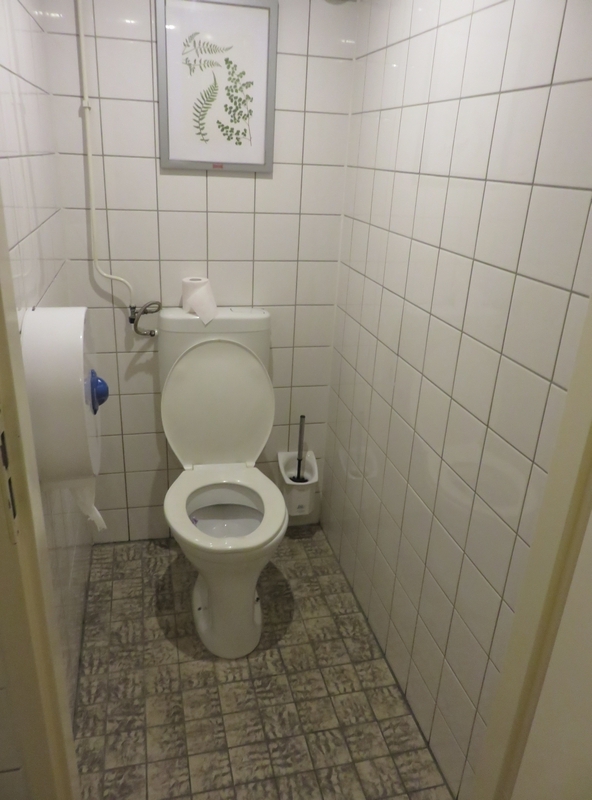 We had made a reservation, but that didn’t seem to be necessary, as there was still plenty of space available (it was a Friday evening). 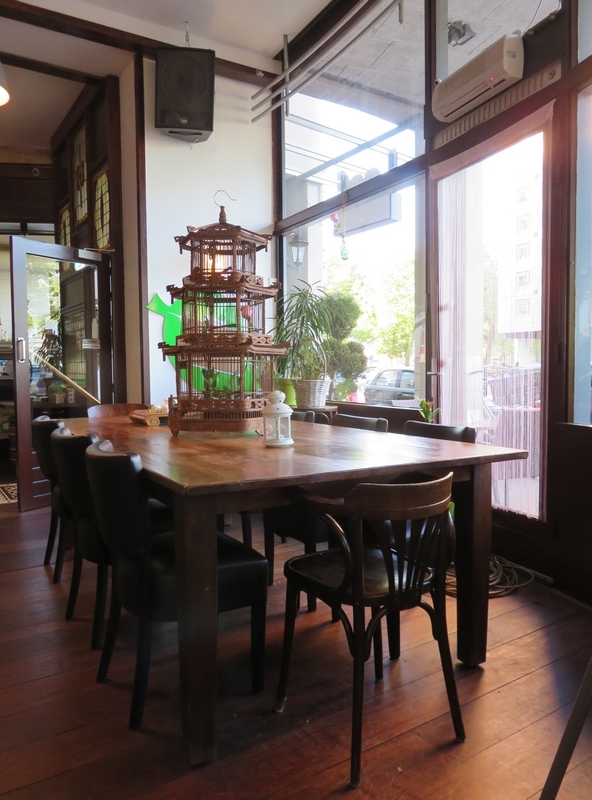 Restaurant Leaf is a spacious place, with a large terrace out front. Although it was a nice Summer evening, it was too windy to sit outside. Inside there’s a downstairs section and some more seating on the balcony upstairs. 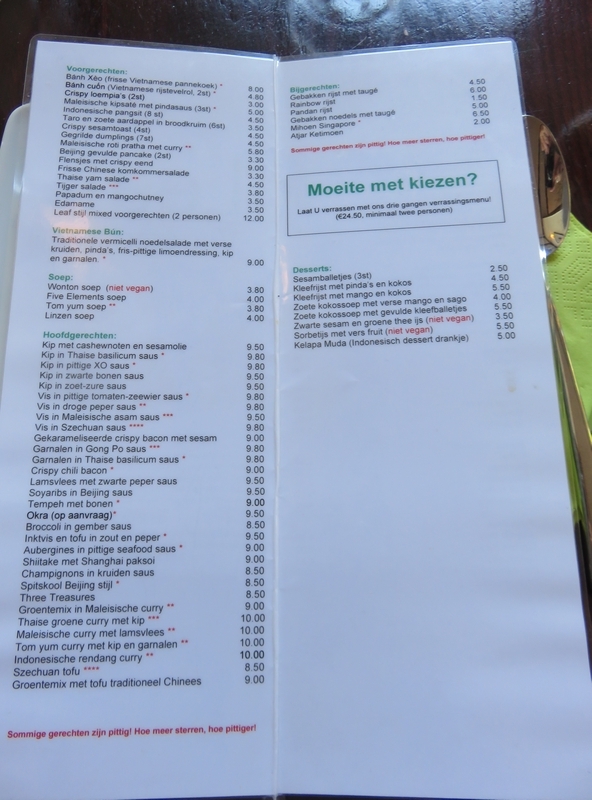 It was hard to choose from the extensive menu! We’re not used to having so many options 😉 The non-vegan items are clearly indicated as such on the menu card, and the spicy ones are marked with stars. 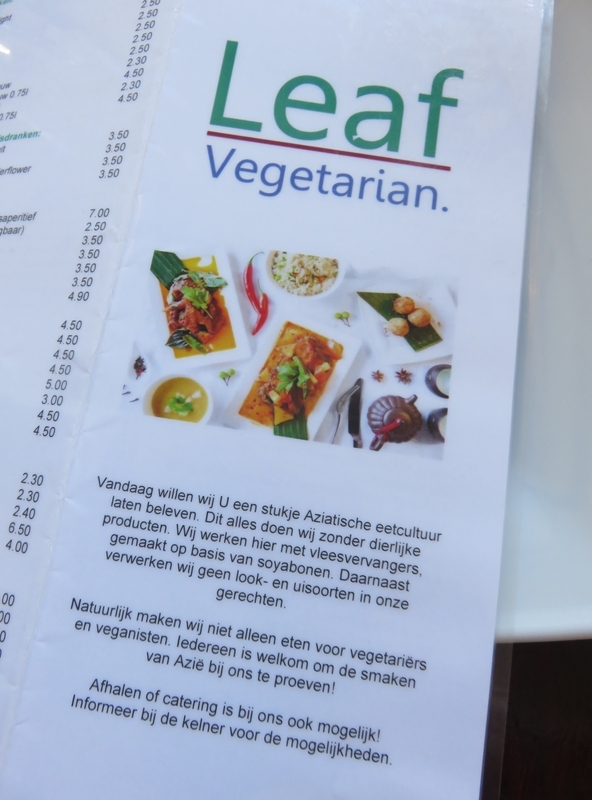 Restaurant Leaf offers a lot of ‘faux’ meat dishes, and although we do like eating those very much, it is a bit unsettling to see all those animal names (squid, shrimps, chicken, fish) on the menu. 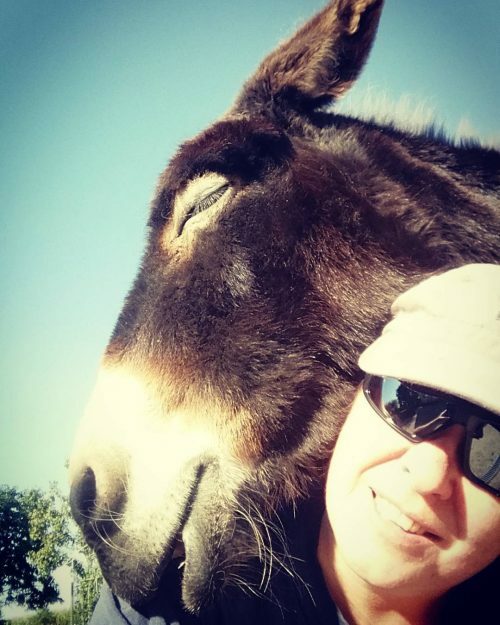 And yes, we understand the reasoning behind it, that such ‘familiar’ menu names make it easier for non-vegans to try vegan dishes and to choose from the menu, but on the other hand , it still perpetuates a rather speciesist look on animals … . We asked for a small snack with our drinks and were served nice freshly baked emping (forgot to take a photo!). Wine was said to be vegan. 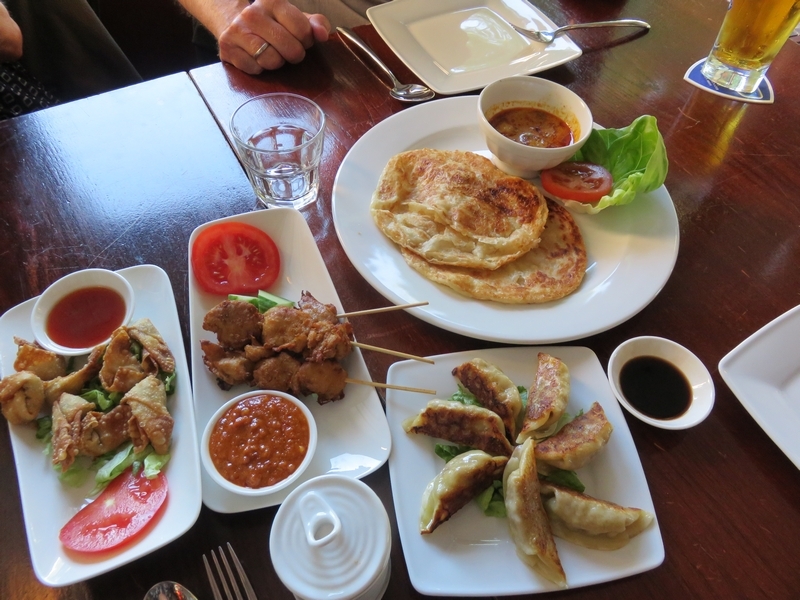 These were the appetizers: ‘chicken’ saté with peanut sauce (5€) , roasted dumplings (4,50€), Indonesian panksit (4,50€), and Malesian roti pratha pancakes (5,80€). Delicious! 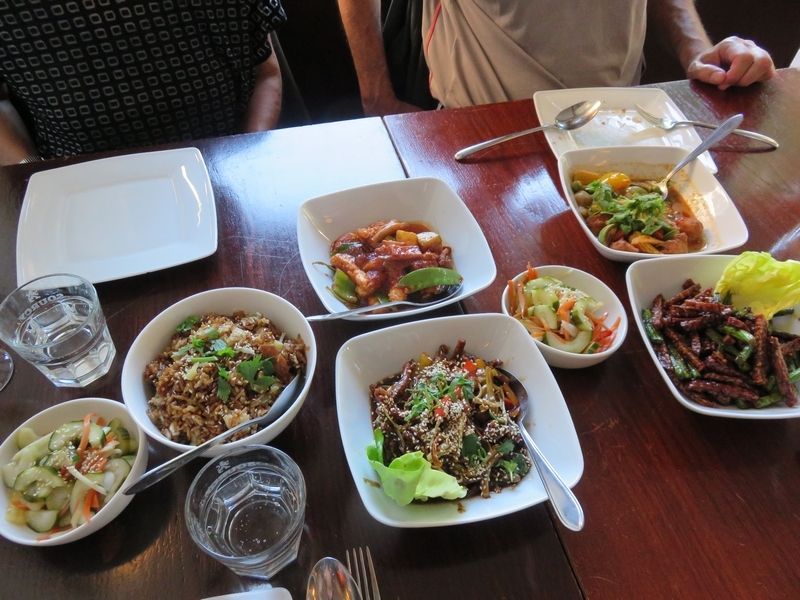 Our main dishes were: crispy ‘bacon’ (9€), tempeh with haricots (9€), ‘shrimp’ in Thai basil sauce (9,80) and tom yum curry with ‘chicken’ and ‘shrimp’ (10€). We asked for two portions of atjar (sweet sour vegetables) on the side (2€ each). 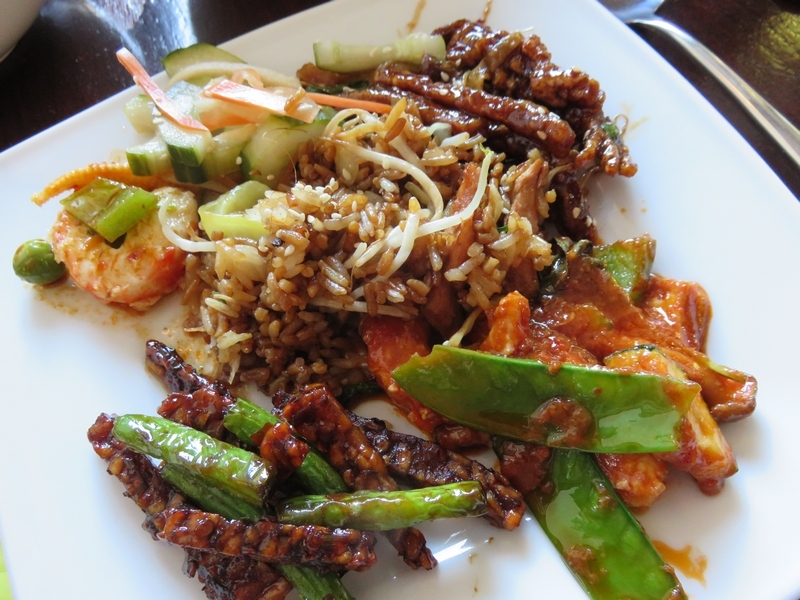 And two portions of fried rice (4,50€ each). For dessert we wanted to order jackfruit (coconut soup with sticky balls), but they had run out. The kitchen suggested coconut soup with mango instead, which was also fine (4€ each). 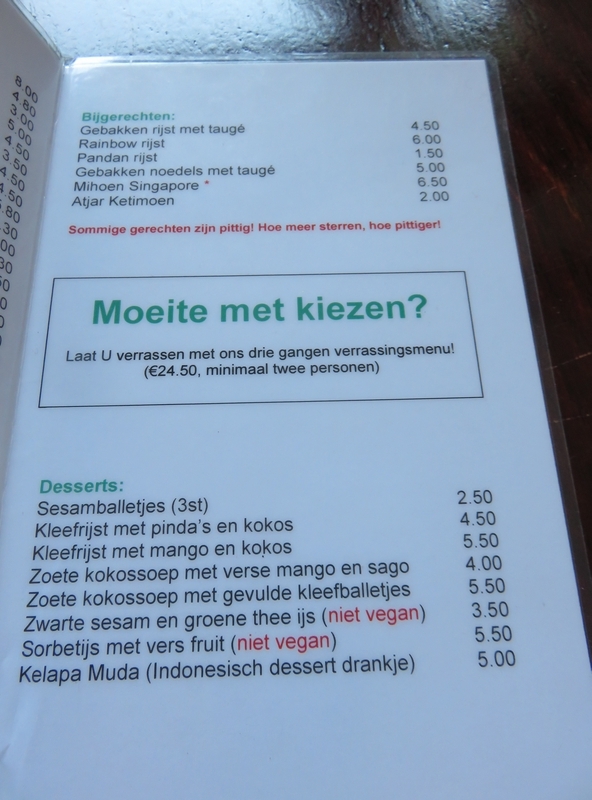 Dessert: coconut soup with mango balls (4€ each), Leaf, Rotterdam. Tea was 4€. 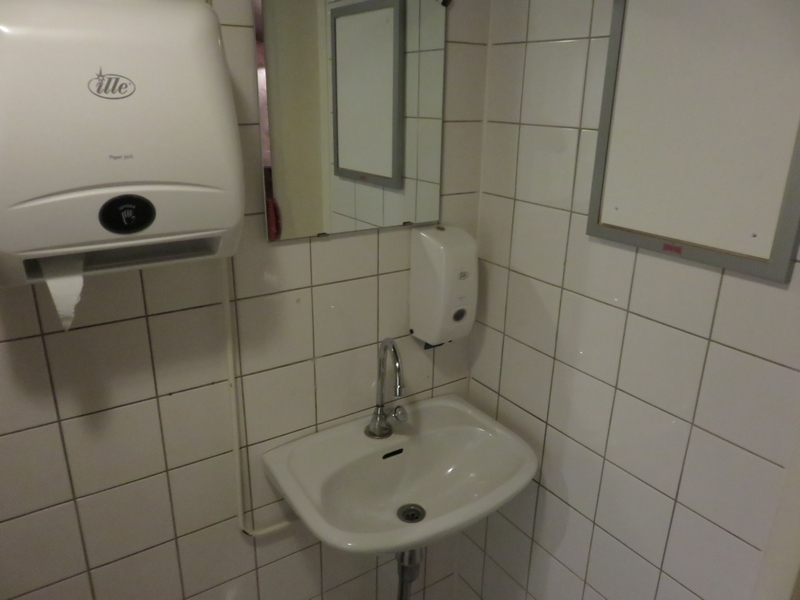 Toilets are upstairs just around the counter and were clean. 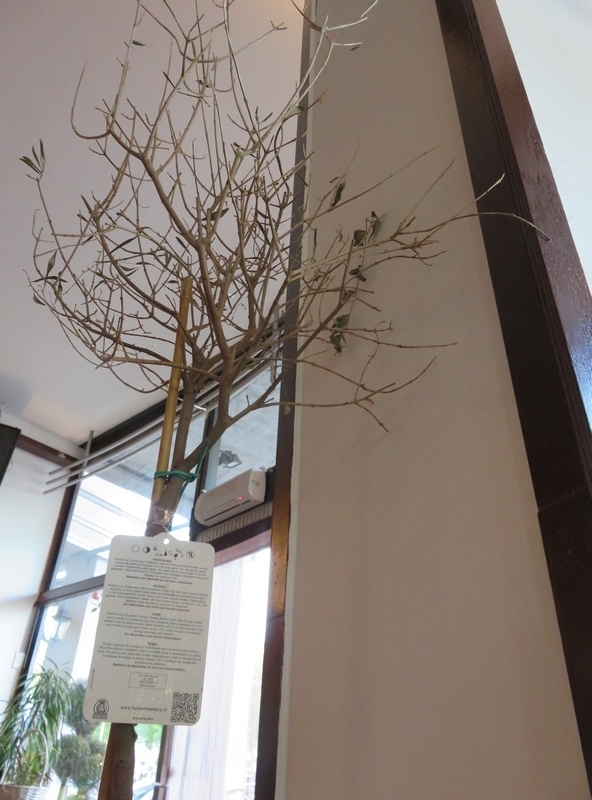 dead (as good as) olive tree inside … Leaf Rotterdam. 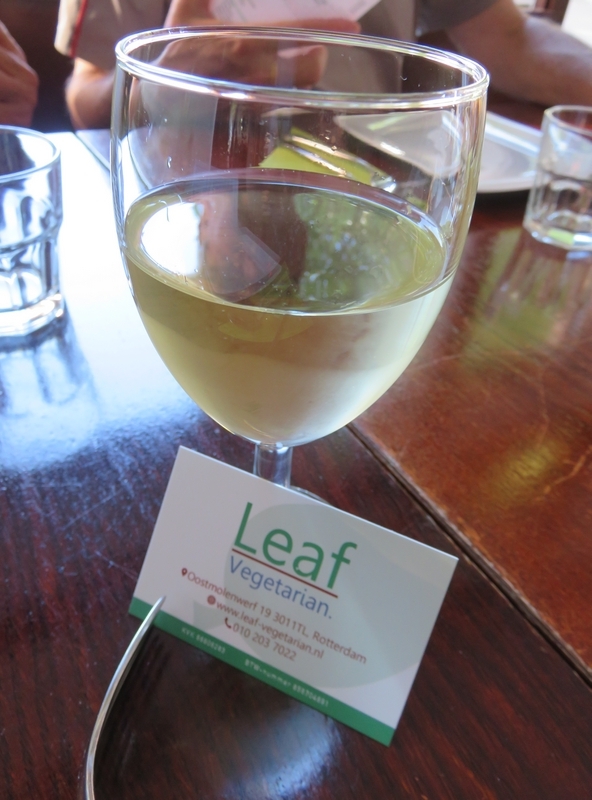 All in all: we had a very nice dinner at Leaf. 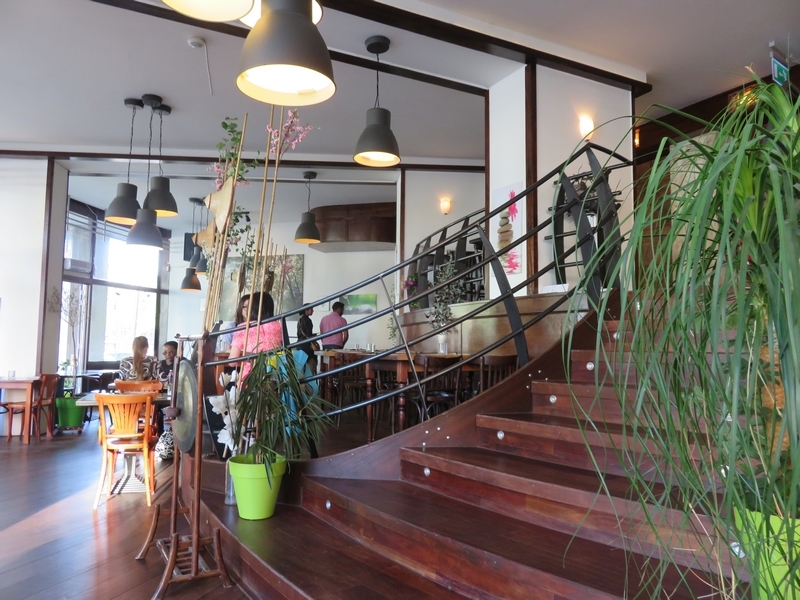 Very friendly and welcoming, relaxed atmosphere. We loved the food and the variety! Great value for money. Definitely recommended!